The web server with the IP-address 192.232.249.155 used by Certification-crazy.net is owned by blackarmada.com and is located in Houston, USA. There are many websites run by this web server. The operator uses this server for many hosting clients. In total there are at least 99 websites on this server. The language of these websites is mostly english. Some websites on this web server are not suitable for minors. 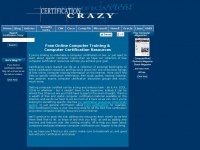 Because Certification-crazy.net was not classified as a website for adults, the proximity to other adult websites could impact the classifcation of this website negatively. The websites of Certification-crazy.net are served by a Nginx server. The markup language of the website is XHTML 1.0 Strict. Both the inclusion of the website in search engines and follwoing of its hyperlinks is explicitly allowed.